So much of what we do is based on a cook’s acquired ability to beat the clock, to work like hell to maintain a level of excellence while jamming on a rail full of tickets designed to hit and run. Turning tables becomes a goal, ticket times are a measure of success, mise en place is the only thing keeping a cook from falling so deep in the weeds that it seems impossible to come up for air. To a point, this can be exciting – trying to corral the adrenaline rush into a positive fuel and driving force that keeps total chaos at bay. We have all been there time and time again. Cooks take pride in their ability to meet the demands of the POS while still plating really good food – some of us even find the time to make those plates attractive enough to draw a few thumbs up from guests and a fist bump from our co-workers. This is what it’s all about; this is what we jump out of bed to replicate every shift. We take pride in putting one arm at a time through that crisp chef’s coat, tucking our hair under the toque or skull cap, tying on an apron and folding a side towel, just so, to rest on the strings of our apron. We are ready for battle. I did my time on the line and know for sure that it is a young person’s game, but whenever I see a line team in sync I get that tingly feeling just like I did when I was in my twenties warming up for that blast of tickets. I always admire line cooks and the dance that goes along with service. Watching the action is a powerful experience, an experience that is hard to describe to those who have not endured that impossible lunch or dinner rush. I am amazed by breakfast cooks with their poetic pace and never ending rhythm; I shake my head in disbelief when I get to see short order lunch cooks juggle an expansive menu that must kneel to the 30 minute master that is constantly breathing down their necks. I smile while watching that dinner crew of seasoned pirates who manage flames, cherry hot flat tops, and searing hot sauté pans and are still able to take a few extra seconds to gingerly place that fresh herb on top of a dish just as it hits the pass. All this is intoxicating, but nothing can compare to experiencing one of those majestic few kitchens that seem to be a dream rather than reality. You know – those kitchens that have won all kinds of accolades and maybe even the prestigious Michelin star. These operations and the chefs who take the helm are on every serious cooks bucket list – even though we may never be able to muster up the funds to make a reservation. We save up and buy their books, read articles about them in the paper and in food magazines, try to copy some of their recipes, and know who they are well enough to recognize them passing on a busy city street or rushing by at a food show event. I am sitting in the airport in San Francisco waiting for the red eye flight to New York’s JFK and running through my experiences as a diner over the past eight days. The Slanted Door in San Francisco was great as usual – terrific Vietnamese fare, family style presentations, quick and attentive service – and a view of the kitchen line. The fact that the restaurant was deafeningly loud was overcome by the ability to watch the ten line cooks work in perfect symmetry. A small French bakery café became our go-to morning breakfast stop for fantastic pastries and world-class espresso drinks – this was not a tourist trap, but rather a small corner neighborhood operation on the edge of Chinatown. A tacqueria in Napa became the place to go for lunch and dinner with a tremendous rotisserie chicken taco on homemade tortilla –drop dead delicious. But it was our second to last day in Yountville that moved from great food to an inspiration. Lunch at Bouchon was a throw back to the classic brasseries in Paris. The menu was a reflection of those times a hand full of years back when I had the privilege of spending memorable days in France. The pate de campagne was exquisite, the roast chicken spot on, and the local wine selection by my friend Jack Edwards was just the right marriage. Service, as you would expect, was technically well rehearsed, but in the style of a brasserie or bistro, was still friendly and comfortable. Following lunch we received, again thanks to Jack, a private tour of the French Laundry – back-of-the-house. To say that it was an honor would be a terrible understatement. To say that I was excited would be fair, but unworthy of how I truly felt. We walked through the wine storage with the sommelier – a really young guy who started at the bottom with Thomas Keller and now manages a million dollar inventory. Each bottle was tucked away and revered in an environment that was worthy of a wines important journey from vine to bottle and in some cases – aging for many years. It would take a lifetime to enjoy the breadth of sensory experience that the walls of this room held. A step into Keller’s multi-million dollar kitchen makeover was like walking into one of those incredible houses of worship that dot the landscape of France and Italy. A shiver went up my spine as I tried to take it all in during this brief encounter with one of the world’s most famous kitchens. The space was, of course, impeccably clean. Each station was it’s own domain with methodical instructions on how the chef wanted each dish prepared and represented. At this level there is no room for mistakes of any kind. It was evident that every cook was 100% focused, somewhat nervous about the weight on his or her shoulders, and totally committed to the knowledge and skills that led them to their role in a Michelin Three-Star restaurant. I met the sous chef who was working at the expo station, putting his stamp of approval on each dish before it left the kitchen. He had been with Keller for nine years and counting – the same length of time as that young, highly competent sommelier. You could feel his level of competence and as such – his confidence. He smiled, shook my hand, chatted for a minute, and then gave me the chance to stand at his station. The only other time I felt that inspired was when in Ville Neuf Lobert, France – I placed my hand on Escoffier’s desk. Now some my find these statements of reverence as maybe extreme, or even borderline absurd, but this is the career that I have spent 50 years at. The kitchen is as much a part of me as nearly anything else (except my family) and to be in the presence of such focus, such dedication, such professional calm made me feel both at ease and sorry that I had not taken an opportunity to work at such a place when I was young and hungry to learn. Not every restaurant can aspire to be like this mecca in Yountville, and certainly the market for $500 per person dinners is rather small, but being in the presence of this level of excellence is bound to rub off on anyone. 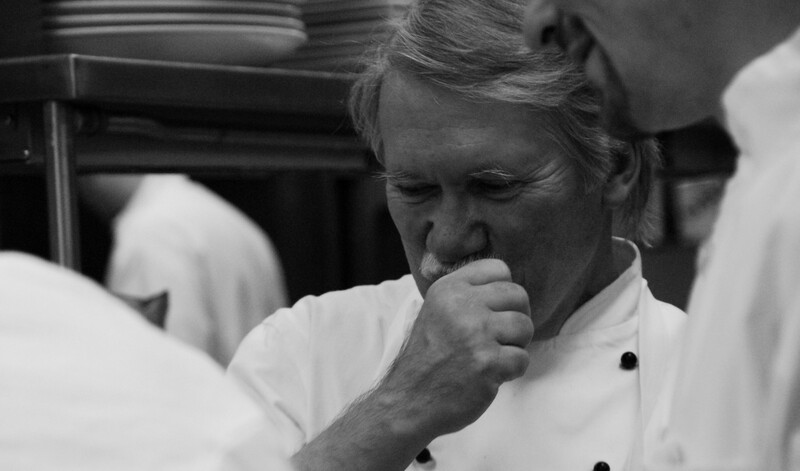 Seeing cuisine at the highest level will bring home the importance of striving for excellence in our own kitchens. It matters not what type of restaurant we call home, it means little what type of food we prepare as long as we exhibit passion, stay committed to on-going improvement, dedicate our career to learning and growing, and take pride in doing things right. Tacos or truffles – it’s all the same when the goal is excellence. Thanks to Jack Edwards for the open door and to the staff at the French Laundry who took the time to welcome me into their incredible home for a few short moments. Restaurants and chefs that inspire are in constant search of greatness, perfection, and the ability to make a difference. Knowing that perfection is never possible they rely on the search for it as their driving force.